This is one that I find HARD TO BELIEVE! Those who say and profess to be someone other than themselves. Myself, I do not know why someone would want to say they are a Vietnam vet and not truly be. Of course there is the obvious, they want the recognition of being with the Special Forces, Special Ops, Rangers, Airborne, Seal Teams, PJ’s etc. BUT those who profess to be and ARE NOT….SHOULD BE EXPOSED for who they really are! I support the following link in their efforts in exposing such individuals and setting the facts straight. We as Vietnam Veterans have had enough problems brought upon us and do not need more issues to deal with! 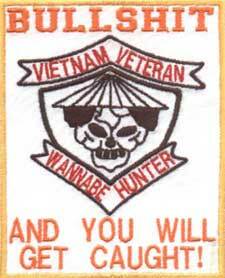 PLEASE click on the following patch and support our efforts in cleaning up the Vietnam Veteran Wannabes on the Internet! !